Everything—where we pin our hopes, how we raise our children, what we do in times of joy or sorrow, everything we aspire to, think, and believe—boils down to how we answer one question: Who is God? 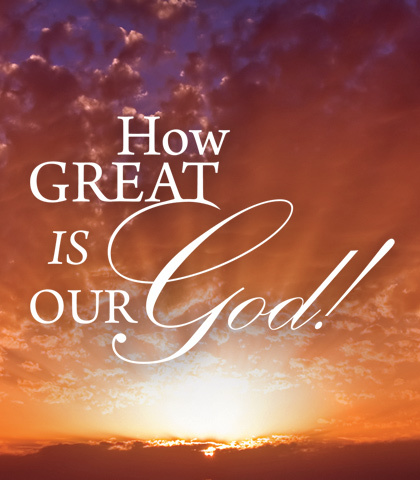 In the series How Great Is Our God! Chuck Swindoll reminds us of the holiness and majesty of God the Father, the humility and self-sacrificing love of the Son, and the ministry and counsel only the Holy Spirit can provide. These messages provide an anchor of biblical hope in God for believers in times of both tumult and peace. Some Bible words have been handled and mishandled for so long they've become shopworn and of very little interest to anyone. Not so with the word grace; it still retains its lustre and mystery. The Bible makes it clear that Jesus came to earth to seek and to save those who are lost in their sin (Luke 19:10). But why did Jesus do this? Those who are meek and mild possess a character too wimpy for the times, so we think. We love lions, not lambs. But Jesus demonstrates that meekness isn't weakness—it is incredible strength. The Apostle Paul warned us to turn our attention to what really matters—the cross of Christ—even if the world thinks it foolish and weak. Because through the cross, God blesses. Of the three persons in the godhead, including God the Father and God the Son, God the Holy Spirit is the least understood and the most mystifying. Let's dispel some of the myths and mystery by getting reacquainted with the Spirit of Power. All of us who follow Christ have sensed God's working, even if we couldn't put our finger on exactly what He was doing. But how do we recognize it? This spiritual sense comes from the Holy Spirit who indwells every believer and who gives believers inner promptings to participate in God's activities in their lives.